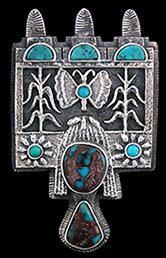 This cast pin/pendant of a Maiden with corn and butterfly symbols on her tableta, along with pieces of Bisbee and Kingman turquoise, comes to us from Hopi Silversmith, Gerald Lomaventema. The piece measures 1 5/8 by 2 5/8 inches. Gerald's hallmark, a Bear Paw, his Clan symbol is stamped on the reverse side. Created by Silversmith, Weaver Selina we present this feather-shaped pin featuring rain, lightning and prayer feather designs. It carries a bright satin finish and measures 3/4 by 2 5/8 inches. Weaver's hallmark and clan symbol, the Rising Sun is stamped on the reverse side. This highly polished badger paw pin/pendant was created by Hopi Silversmith, Ramon Dalangyawma. Badger is known for its aggressive healing powers, which is why it is the emblem for the Hopi EMTs. This piece measures 1 1/8 inches at the widest part by 1 7/8 inches. Ramon's last name is his hallmark and is stamped on the reverse side. This lovely butterfly pin with water and prayer feather designs has a bright satin finish, measures 1 1/4 by 1 3/4 inches and carries on the back, the Rising Sun hallmark of Silversmith, Weaver Selina. This lovely, small choker was created by Hopi Silversmith, Weaver Selina. It is highly polished, features designs for prayer feathers, raindrops, clouds and rain, measures 1 by 2 inches with 6 1/4 inches of sterling silver chain on each side. Weaver's hallmark and clan symbol, the Rising Sun is stamped on the reverse side. 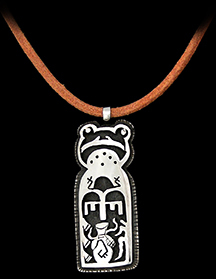 Young Hopi Silversmith, Clinessia Lucas created this frog pendant and describes the design: "The Frog, the Hopi Rain Cloud, prayer feathers and water jug are bringing moisture for the corn stalks, our plantings." This piece is highly polished and measures 3/4 by 1 7/8 inches and has Clinessia's hallmark stamped on the reverse side. A Big Horned Ram with a heart-line of lightning is featured on this highly polished pendant by Silversmith, Chris Mansfield. It measures 1 by 1 5/8 inches and has Chris' initials on the reverse side. Chris' "critters" are uniquely identifiable as his work! Beautifully crafted by Silversmith, Weaver Selina, this highly polished, arrowhead shaped pendant with a prayer shrine in the center measures 3/4 of an inch at its widest part by 1 3/8 inches from the top of the bale to the bottom. Weaver's Rising Sun hallmark is stamped on the reverse side. This Shalako appears in Rose Gold over Sterling Silver and was created by Hopi Silver/Goldsmith, Watson Honanie. The piece measures 1 1/4 by 1 5/8 from the top of the gold bale to the bottom. Watson's hallmark, the Bear Paw with Friendship Marks in the pad is stamped on the reverse side. Remembering the beauty of a single snowflake in the midst of the piles of snow surrounding many of us during the Winter season may be difficult. This beautiful pendant by Hopi Silversmith, Ramon Dalangyawma is a gentle reminder. This highly polished piece measures 1 1/2 by 1 3/4 inches from the top of the bale to the bottom point. Ramon's last name is his hallmark and is stamped on the reverse side. 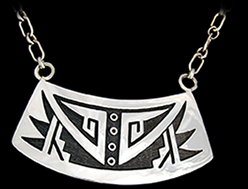 This lovely pendant comes to us from Hopi Silversmith, Clinessia Lucas. In Clinessia's own words, she describes the design: "Hopi Eagle Messenger Pendant...the Eagle has always been a messenger for the Hopi people. The Healing Hand is representing the life of man that has the ability to work and talk with the Eagles as we need them in our everyday lives to carry our prayers, blessings and spirits to the heavens, which sends us the moisture to irrigate our crops and plantings." This piece measures 1 inch by 1 3/4 inches from the top of the bale to the bottom. Clinessia's hallmark, a Bear Paw and Corn Stalk is stamped on the reverse side. Summer will be here before we know it and with it the dragonflies will arrive. This highly polished dragonfly was created by Hopi Silversmith, Merle Namoki and carries a prayer feather design along with raindrops on it's wings. Prayers for moisture! This piece measures 1 3/8 by 1 3/4 inches and carries Merle's hallmark, the Sun's Forehead on the reverse side. This highly polished pendant featuring a piece of Lapis has clouds and whirlwind designs, is suspended from an 24 inch sterling silver chain, measures 5/8 by 1 3/4 inches and is 1/8 of an inch thick. A substantial piece, slightly concave in structure and carries Silversmith, Duane Tawahongva's initals DT on the reverse side. 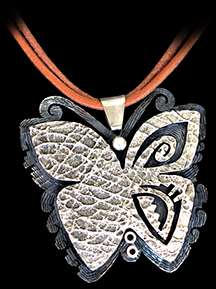 Hopi Silversmith, Trinidad Lucas as created this beautiful tufa cast pendant honoring the butterfly. In the wings is a bean sprout and cloud and rain designs. (For those unfamiliar with the process of casting, tufa is a volcanic, porous and finely textured stone. The artist carves the design into a stone mold and pours the molten silver into it.) This piece measures 2 3/8 by 2 1/4 inches and carries Trini's hallmark, TLd inside of a bear, her clan symbol on the back, which is not cast. 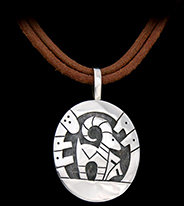 This satin-finished pendant features the Flute Priest, the Path of Life design and prayer feathers. It measures 1/2 by 2 inches from the top of the bale to the bottom. Artfully created by Silversmith, Duane Tawahongva and carries his DT hallmark on the reverse side. Shown here, the piece is suspended from a 24 inch handmade silver chain by Loren Kootswatewa. Pieces may be sold separately. 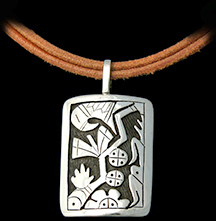 A village scene appears on this satin-finished Hopi pendant by Trinidad Lucas. It measures 3/4 by 1 1/4 inches and is suspended from a 20 inch sterling silver chain. Trini's TLd hallmark is stamped on the reverse side. Hopi Silversmith, Weaver Selina makes the best medicine bear pendants! This highly polished piece measures 1 by 1 inch and is suspended from a 20 inch, sterling silver chain. The designs include a prayer feather, clouds and lightning. Weaver's hallmark, the Rising Sun is stamped on the reverse side. A village scene with corn growing and prayer feathers all under the watchful eye of Tawa, the Father Sun appear on this highly polished pendant by Silversmith, Chris Mansfield. It measures 3/4 of an inch wide by 1 3/8 inches from the top of the bale to the bottom. Chris' initials are his hallmark and appear on the reverse side. Shown here, the piece is suspended from a 24 inch handmade silver chain by Silversmith, Loren Kootswatewa. This small, highly polished turtle pendant with friendship marks on its shell was created by Silversmith, Merle Namoki. It measures 1/2 of an inch wide by 1 1/8 inches from the top of the bale to the bottom. Merle's hallmark, the Sun's Forehead is stamped on the reverse side. To the clans, deer and elk are sacred animals. When they are killed, they are giving the gift of life to the people, thus the animal is dressed out in a Hopi way with turquoise necklace and kilt and treated as a person would be treated in death. It is prayed over and the meat is divided throughout the family. It represents the coming together of all peoples, being happy and staying strong together. Featured here is an elk surrounded by prayer feathers, Tawa, the Father Sun, clouds and rain. Expertly crafted by Hopi Silversmith, Chris Mansfield, this highly polished piece measures 1 by 1 5/8 inches and carries Chris' initials on the reverse side. 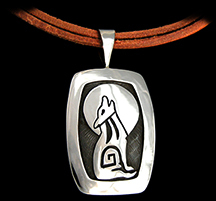 Coyote is singing his song to the moon on this highly polished pendant by Silversmith, Merle Namoki. The piece measures 1 by 2 inches and carries Merle's hallmark, the Sun's Forehead on the reverse side. Prayer shrines are often seen around Hopi...groups of feathers on sticks in the ground or on a mound. The feathers of birds, who fly close to Tawa, Father Sun carry the prayers of the people to him. In the case of prayer shrines, the wind also aids in this task. This highly polished pendant by Silversmith, Chris Mansfield shows a prayer shrine with Father Sun looking on. It measures 3/4 by 1 3/8 inches and is shown here suspended from a 24 inch Hopi handmade small link chain, expertly crafted by Hopi Silversmith, Loren Kootswatewa. Chris' initials are etched on the reverse side. This highly polished, small pendant from Silversmith, Ramon Dalangyawma, features a migration symbol which travels from the "Source" of all life. It measures 7/16 of an inch across by 1 inch from the top of the bale to the bottom. It is suspended from a 24 inch, Hopi handmade, small linked chain created by Hopi Silversmith, Loren Kootwatewa. Ramon's last name is stamped on the reverse side. This satin-finished pendant by Trinidad Lucas features the Path of Life symbol and corn, a staple of life for the Hopis. It measures 7/16 of an inch wide by 1 3/8 inches from the top of the loop to the bottom of the piece. It is suspended from a 24 inch sterling silver chain. Trini's hallmark, TLd is stamped on the reverse side. Flute Priest appears on this highly polished pendant measuring 1/2 by 5/16 of an inch and is suspended from an 18 inch sterling silver chain. Beautifully crafted by Silversmith, Duane Tawahongva. His initals are his hallmark and appear on the reverse side. 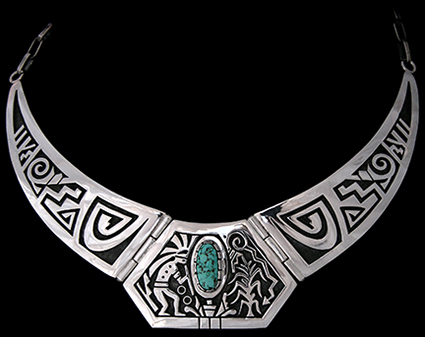 A lovely piece of Red Mountain Turquois is the centerpiece of this three piece choker by Silversmith, Merle Namoki. Surrounding the turquoise are designs of a Flute Priest, Prayer Shrine, Corn Stalk and Lightning. The side pieces feature designs for clouds and water...this piece is all about praying for the moisture to bring the crops to life. The centerpiece measures 1 1/4 inches wide and tapers down to 1/8 of an inche at the eye rings. Six inches of hand made chain is connected to each ring. Merle's hallmark, the Rising Sun is stamped on the reverse side. A very powerful, beautiful and prayer-full piece!